Tamil Nadu Engineering Admissions 2018 (TNEA-2018) is completely online – Registration, Payments, Choice filling and confirmation. 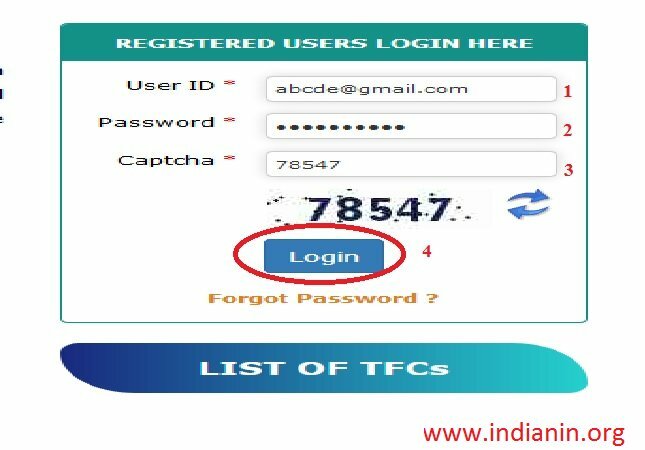 Candidates have to register their applications online, submitting all the required details and fee, have the certificates verified through TNEA Facilitation Centre (TFC), give their preferred choices online during the specified period, get their allotment confirmed and get the allotment order online. 3. Certificates Verification at Designated TNEA Facilitation Centre. ** Tamil Nadu candidates, who have passed VIII, IX, X, XI and XII from Tamil Nadu are eligible to apply. They need not enclose nativity certificate. ** Tamil Nadu native candidates, who have passed any of the VIII, IX, X, XI and XII or their equivalent examination from schools situated outside Tamil Nadu, can also apply. ** Sons and daughters of all India service Tamil Nadu cadre officers are eligible to apply. ** Other state candidates, who have studied in VIII, IX, X, XI and XII in Tamil Nadu are eligible to apply. They need not enclose nativity certificate. ** Candidates, who are Srilankan Tamil refugee studied in Tamil Nadu, will be considered under open competition. ** Those, who have not registered in the refugee camp, should submit a copy of passport, visa and letter registered with police station. Candidates read all the instruction carefully. In order to make things simple and systematic the filing of an application is carried out in easy steps. Visit the official Website on TNEA, and Click on “TNEA 2018″ the following screen will be displayed. Once you complete the above details, click on “Send Verification OTP”. Now you will get the following Screen. You will get the OTP in your mobile as well as in your email. Click on “OK” in the above screen which will bring back the previous screen and enter the OTP at the space provided. Now you Enter “CONFIRM” in below text box, then Click Ok Button, User created successfully message will be displayed. Now click on “OK”. You will receive ‘User Id’ in your registered mobile number and it will go to the Login page. 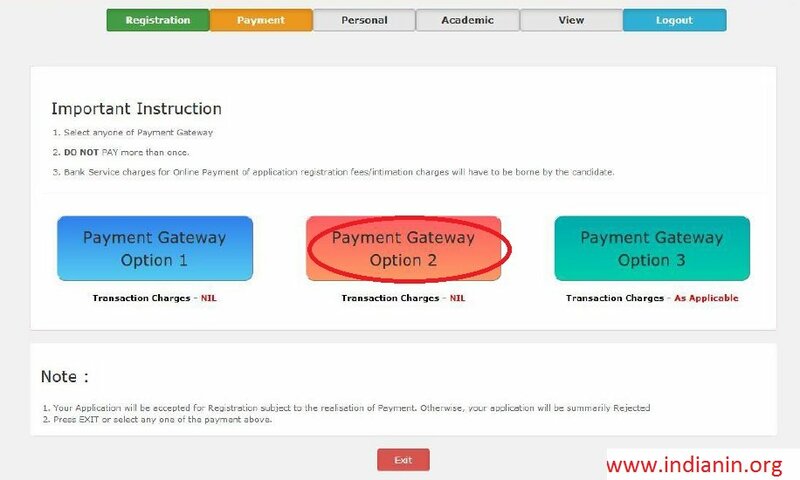 ** Once you login, it will show you the screen for payment of fee with “Payment” highlighted in orange as shown in the screen. ** Now the system will show you the amount to be paid as per the details you have filled-up earlier. ** You can pay the fee through Payment Gateway using your Credit Card/ Debit Card or Net-banking. 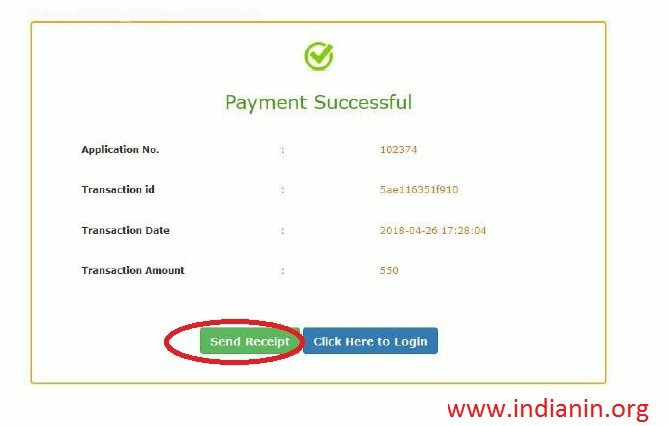 Now you will get the payment gateway page as shown below, you select any one option to pay, you will get the Payment Gateway screen provided by the Gateway service provider. Follow the usual procedure for online payment. If it is accepted you will get the following screen and you will get your Application Number and Transaction Id in you registered mobile number. Payment Successfully screen will be displayed, click on “Send Receipt” you will get the following screen. Click on “OK”, you will get the receipt in your registered email and you can get it printed. Now you will see the ‘Application Status Page’ as shown below, click on “Proceed to Personal Page” to proceed further and the screen will appear. i) Personal information – Here, the complete information about the candidate, address, Date of birth etc. should be given. iii) Civic Status information – Additional information like nativity, medium of instruction are required to be given here. After entering these details, this can be saved by clicking on “Save” for further processing steps. Here the complete details about the course, school studied, examination board, marks etc.And now you enter your details of school studied and qualifying examination marks. 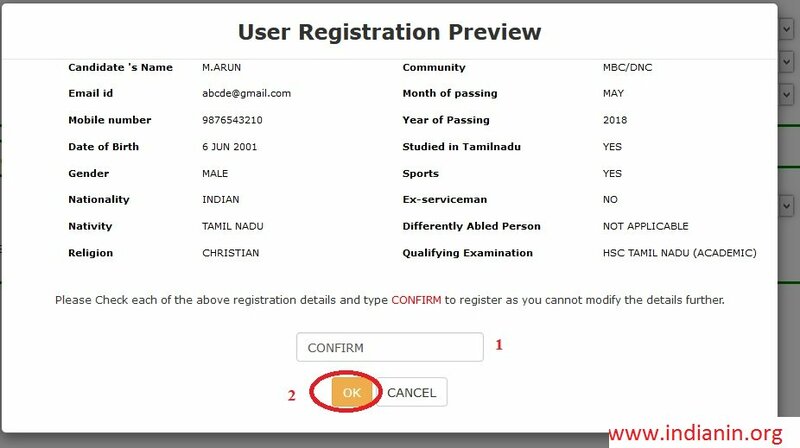 If you are a candidate of 2018 HSC Tamil Nadu Board, you need not enter the marks If you save the information, it will facilitate changes of your information provided. To save click on the “Save” button. Then clicking “OK”, you will get application status screen will be dispalyed. Now you can proceed further to next step by clicking on “Proceed to view your application” and view your application your. The system will come out and send a copy of your application to your email. If you login again you will get the following screen. 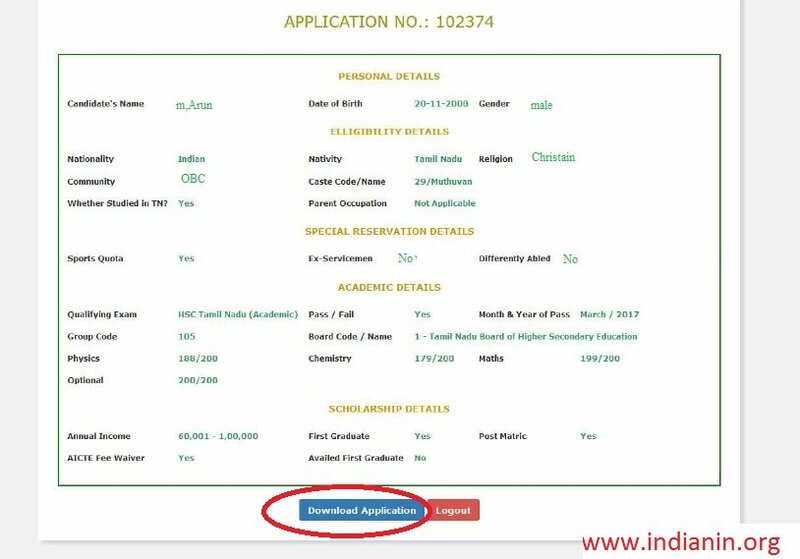 On clicking “Download Application” on the Screen, you will get a copy of your application. You can have hard copy of the application printed out, that has to be produced at the TNEA Facilitation Centre (TFC) for verification along with the original Certificates needed as mentioned in the print out of the application, copies of certificates and your Passport size photo affixed on the application. 2 Chennai Chennai Ramanujan Computing Centre, Anna university, Guindy, Chennai – 600 025. 3 Coimbatore 1. Government College of Technology, Coimbatore – 641 013. 2. Anna University Regional Campus, Coimbatore – 641 046. 3. Coimbatore Institute of Technology, Coimbatore – 641 014. 4 Cuddalore 1. University College of Engineering, Panikkankuppam, Panruti – 607 106. 2. Faculty of Engineering and Technology, Annamalai University, Chidambaram – 608 001. 5 Dindigul University College of Engineering, Mangarai pirivu, Dindigul – 624 622. 6 Dharmapuri Government College of Engineering, Chettikarai P.O., Dharmapuri – 636 704. 7 Erode 1. Institute of Road and Transport Technology, Suriyam Palayam, Erode – 638 316. 2. Government Polytechnic College, Perundurai – 638 053. 8 Kanchipuram 1. University College of Engineering, Kanchipuram – 631 552. 2. MIT Campus, Anna University, Chrompet, Chennai – 600 044. 9 Kanniyakumari University College of Engineering, Konam, Nagercoil – 629 004. 10 Krishnagiri Government College of Engineering, Madepalli, Bargur – 635 104. 11 Karur Government Arts College, Bharathidasan Nagar Road, Thanthonimalai, Karur – 639 005. 12 Madurai 1. Anna University Regional Campus, Madurai – 625 019. 2. Thiagarajar College of Engineering, Thiruparankundram, Madurai – 625 015. 13 Namakkal Thiruvalluvar Government Arts College , Andagalore Post, Rasipuram, Namakkal – 637 401. 14 Nagapattinam University College of Engineering, Thirukkuvalai, Nagapattinam – 610 204. 15 Perambalur Government Polytechnic College, Keelakanavai, Perambalur – 621 104.